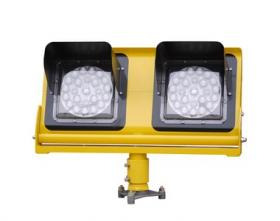 APOLLO - Hi Intensity LED Runway Guard Light - ATG Airports - Description - Elevated runway guard lights for use at taxiway/runway intersections to avoid incursion onto an active taxiway/runway, as required by the standards (CAP 168 & ICAO 5.3.20). The Hi Intensity LED technology allows for optimum performance of the unit in the harshest climatic conditions whilst also providing the time and cost savings associated with new technologies. The Apollo Hi Intensity Elevated LED Runway Guard Light provides a warning to pilots or drivers of ground vehicles that they are approaching an active runway.